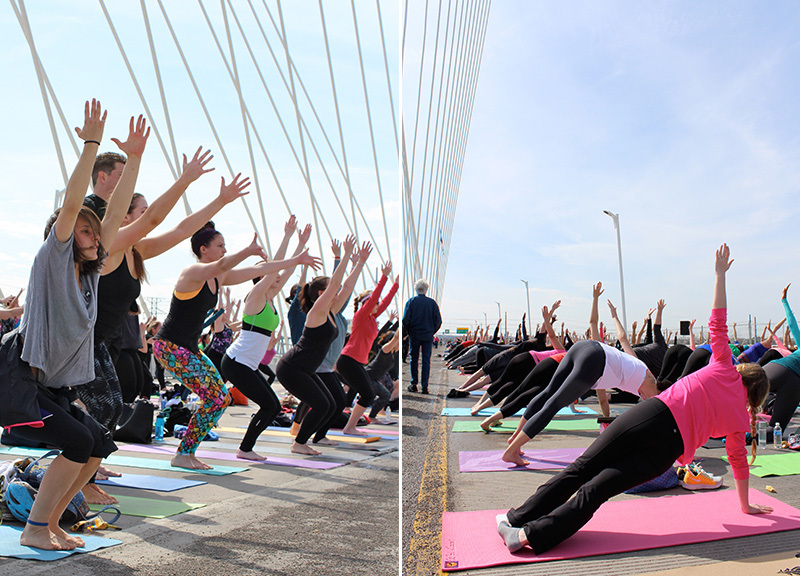 Scenes From Saturday's Yoga On The Bridge Record Attempt Above The Trinity. 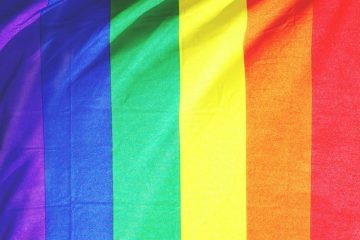 The Trinity Commons Foundation went all out for its annual, daylong and fittingly titled All Out Trinity affair on Saturday. 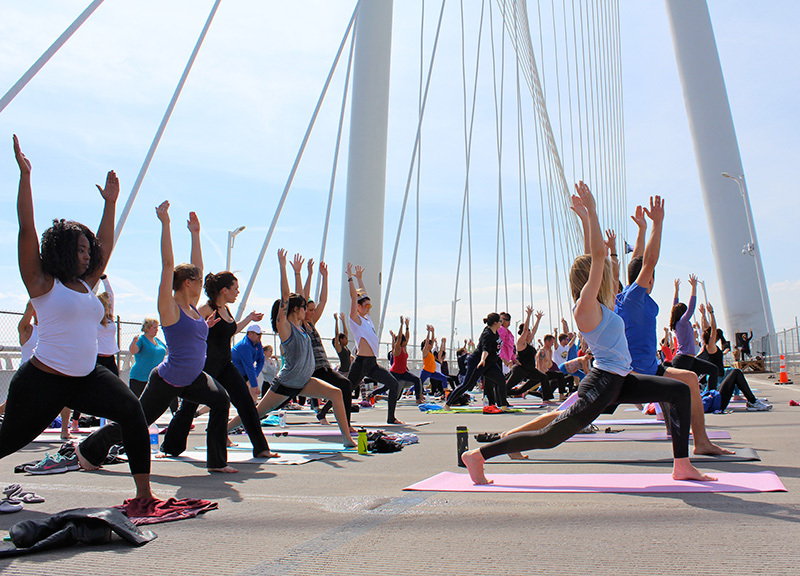 With its aim to promote all the outdoor recreational and fitness activities possible in the developing park area — or, y'know, the things that a toll road might ruin — the event is a key fundraiser for the ever-ongoing Trinity River Corridor Project. 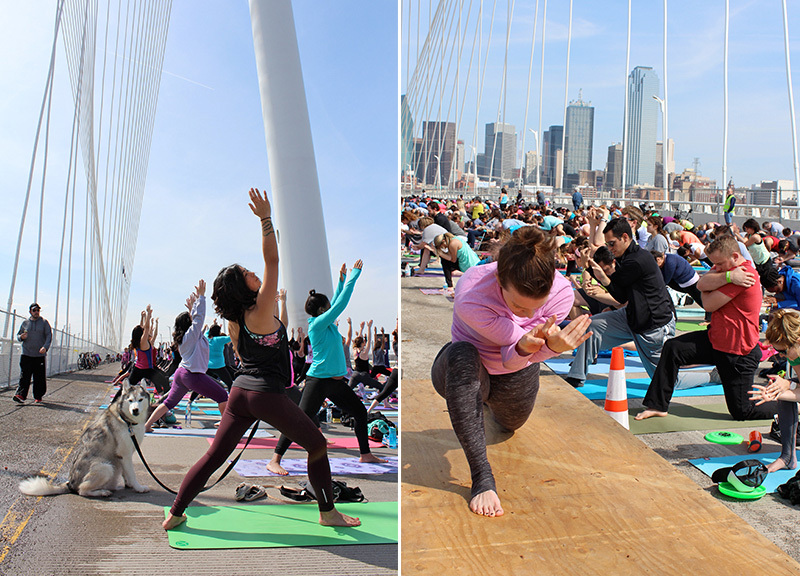 And, sure, it may have caused some headaches through its temporary shutdown of The Margaret Hunt Hill Bridge, but the event certainly seemed to accomplish its mission of bringing people from all over Dallas to the area. 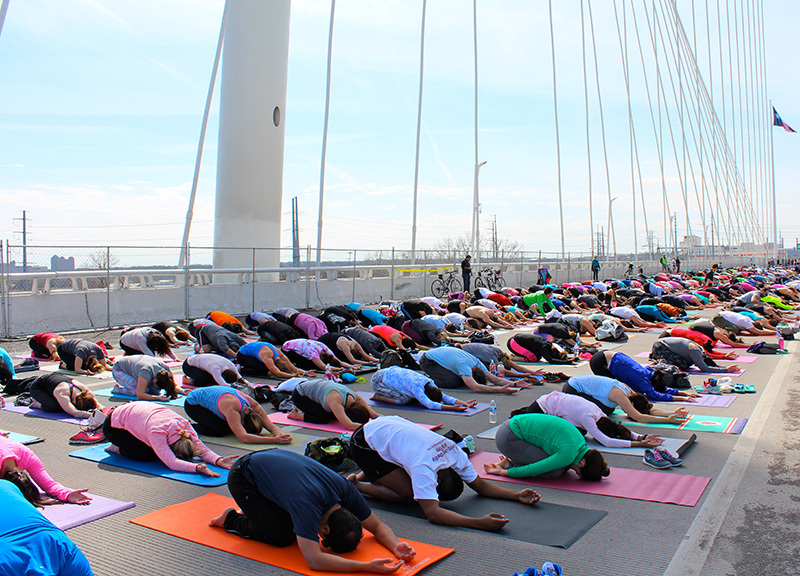 It was an uplifting thing to witness, too: As drivers were getting heated and honking over the closure on I-35, hundreds of others — runners, cyclists, dogs, and even parading activists — were finding inner peace right above the river. 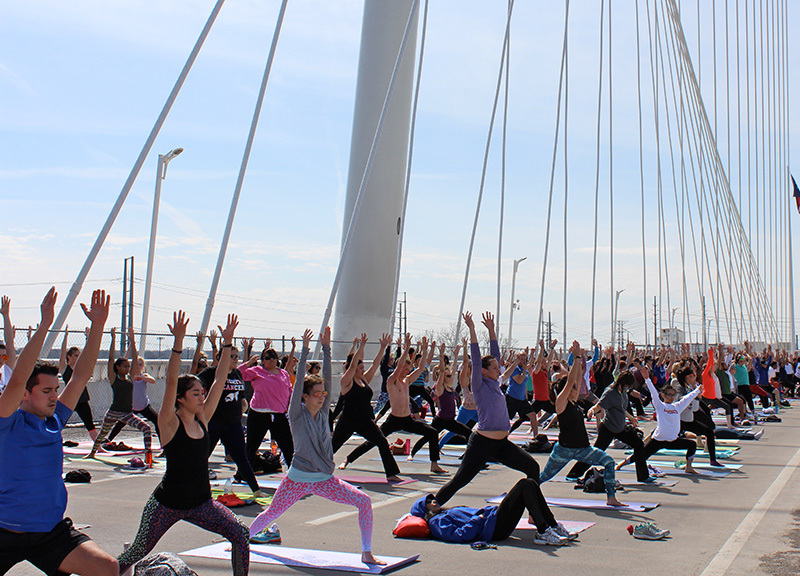 Now in its third year, the “Yoga on the Bridge” portion of the All Out event in particular drew crowds to their spiritual centers and this geographic one alike with its stated goal of trying to break the Guinness World Record of the World’s Largest Yoga Chain, a distinction currently held by an Indian organization with a grand total of 3,849 participants. 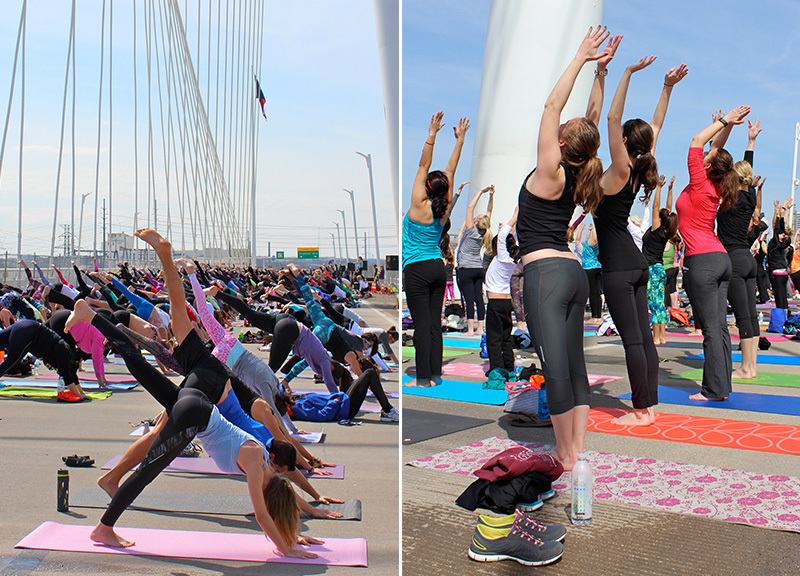 With teachers from some of Dallas’s most popular yoga studios leading the way with an hour-long flow to yogis of all shapes, sizes, and ages, the event stretched across almost the entire length of the bridge. 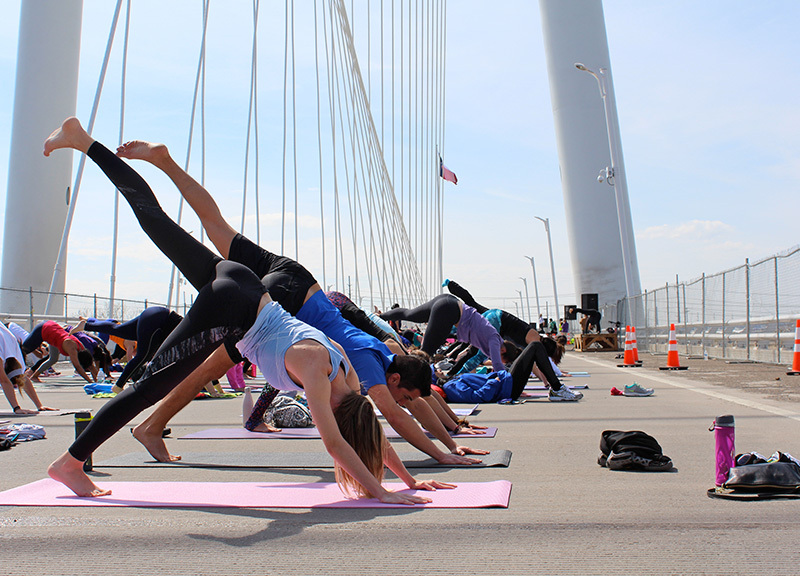 And while Yoga on the Bridge might appear through the eye test to have fallen short in its Guinness attempt — as of now, no official count has been released by organizers — the event did benefit from the end to another streak. To be sure, the affair benefit from its fortunate break from the region's merciless downfall of rain and snow, with the sun coming out just long enough to remind us all that it still exists. 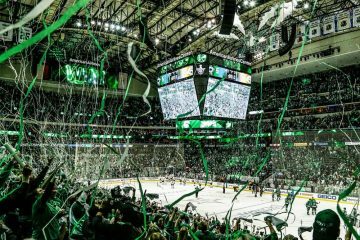 It was a perfect setting, really. 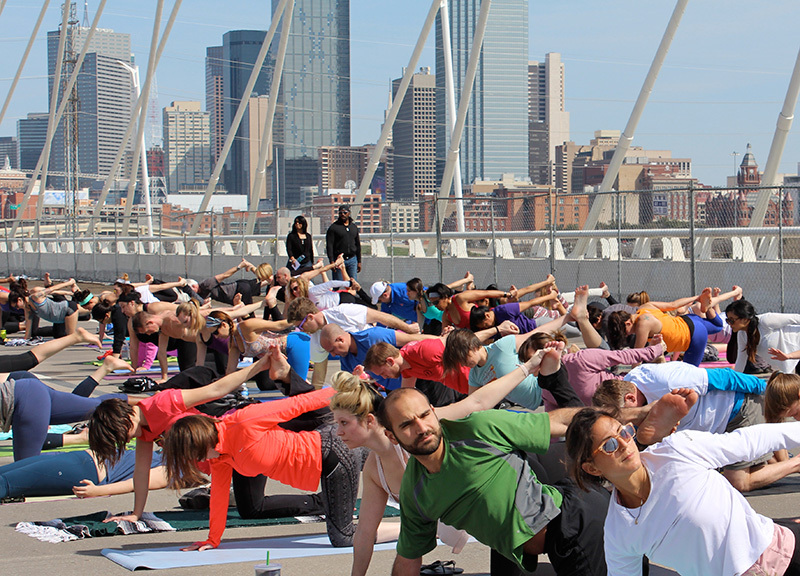 The first half of the class was lead by Jennifer Lawson of SYNC Yoga, who started off by bringing the hundreds of participants into a quiet meditation. She'd have minimal success there — soon as she started, a group of activists also taking advantage of the closure paraded along the other side of the bridge in remembrance of the 50th anniversary of the Selma march — but still managed to utilize the moment as a teachable one. 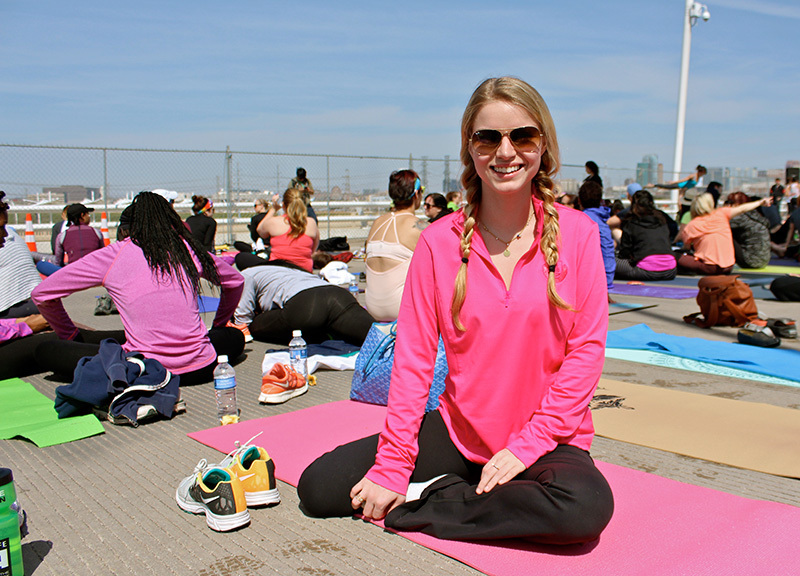 As the memorial march passed, Lawson reminded her participants that a primary purpose of yoga is to unite for a greater good. 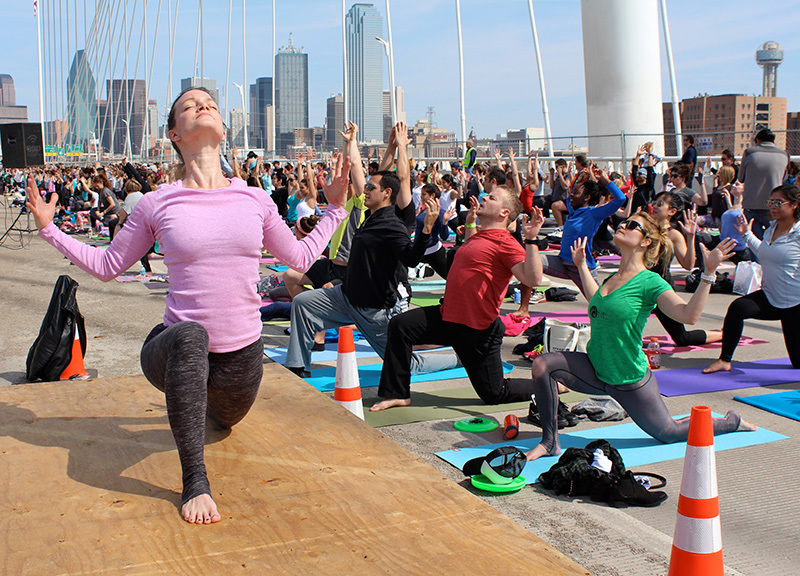 And following her words, the yogis began to clap along in support of the protesters. 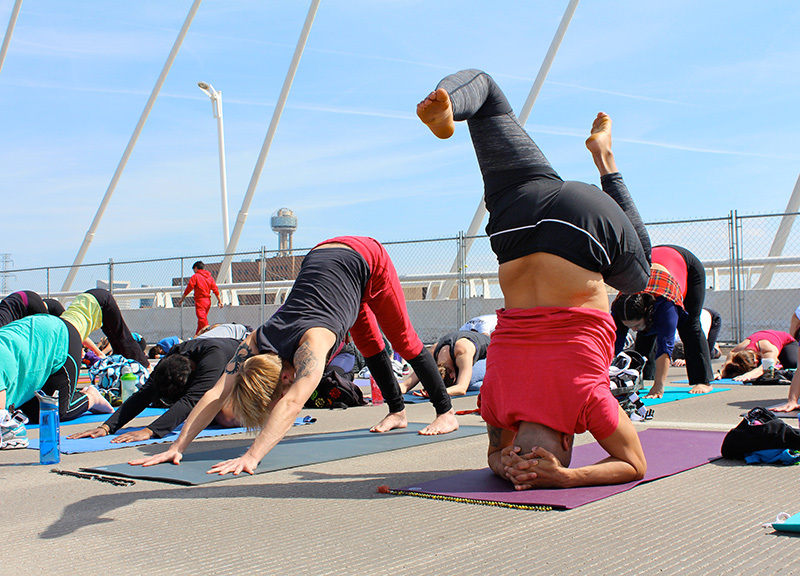 Uptown Yoga’s Janie Montague jumped in after Lawson, taking things up a notch with her witty commentary — plus some truly challenging poses to boot. 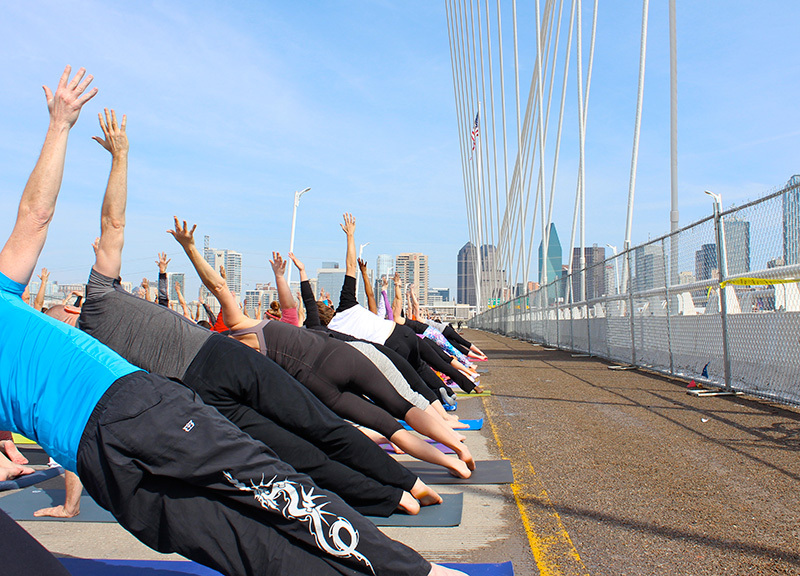 “Let me see that sun shine,” she called out as her yogis bent over into the downward dog position. She even embraced the close proximity of the group, encouraging participants to not fear touching their neighbors when limbs were flying and postures causing participants to lose their balance. She hammered this point home by reminding the group that it was standing on a literal bridge over the gap between Oak Cliff and Downtown. Her message was one of bringing people together. 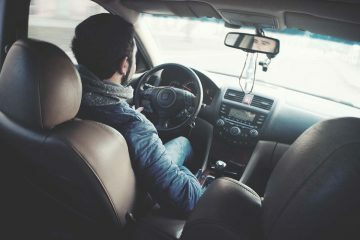 All session long, in fact, it was clear that embracing this sense of camaraderie was the event's aim. 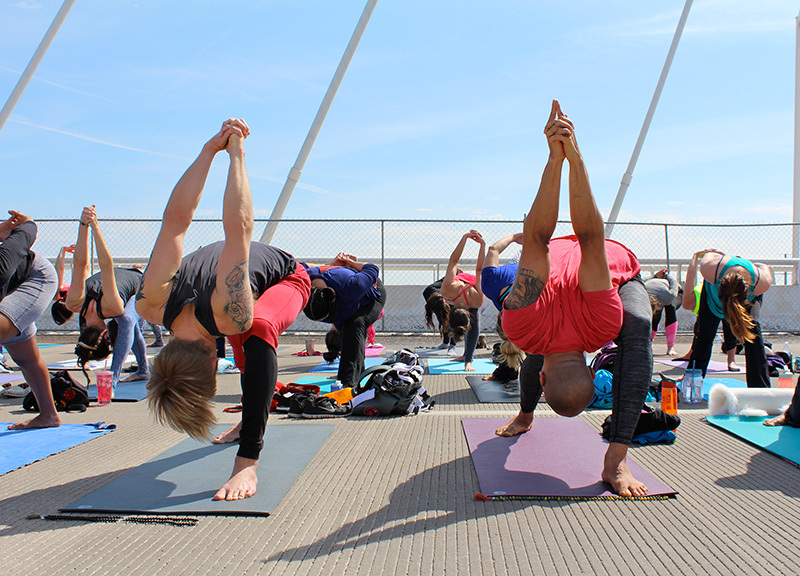 And when every person on the bridge went into the bridge pose, the deal was sealed: This was an excellent day for yoga, and even better day to do it on a bridge. 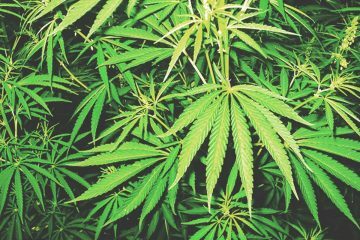 Previous ArticleThings To Do On Monday, March 9.